A lifestyle with a maximum carbon footprint of three tonnes per person by 2030 – that is the goal that the eight pilot households in North Rhine-Westphalia are now working on! 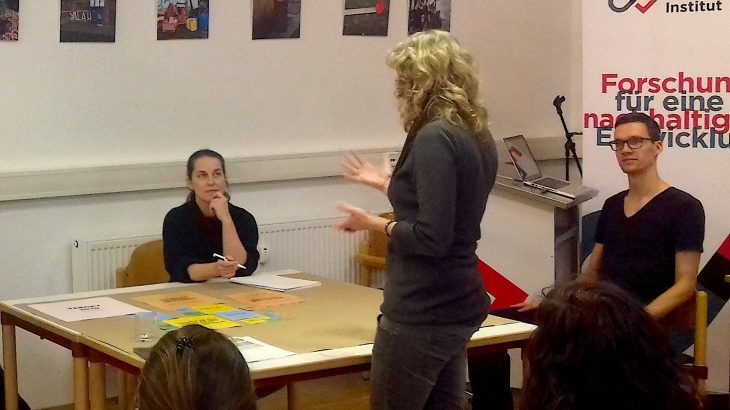 Those eight households participated the joint road mapping workshop at the Wuppertal Institut in the middle of January 2019. They developed first individual strategies for a more sustainable and climate-friendly lifestyle. The personal carbon and material footprints in the five categories daily mobility, housing, nutrition, leisure and household goods of the participating households were calculated on the basis of an online survey carried out in advance. Thus all households could receive an overview about the current conditions of their personal lifestyle and got first ideas about their own hotspots and their associated saving potentials. In the subsequent roadmapping phase, each household selected actions for sustainable carbon reduction in the different areas of life and planned to implement those in a further step by 2030. At the end of the workshop the four-week experimental phase was initiated, during which the households will test the selected measures. We are excited and are looking forward to hear about the experiences at the next meeting at the end of February!